The ride of my life: Practice Makes Perfect? Getting ready for a practice ride. I drove down to Tennessee on Sunday - to get ready for Celebration 2014. The show starts on Wednesday morning - and my class is on the first day - class #2. Since I have only ridden Halo 3 times since I bought him in February (yikes) - I felt it prudent to get a few practice rides in before I showed (at the biggest show of the year!). So, off to Tennessee early on Sunday, so I could practice Monday and Tuesday. I decided since I was driving on Sunday that I would try to shave off a little time, and go the shorter route that goes through Chicago, Indianapolis and Louisville. Bad decision. Although Chicago was a breeze - I ended up losing 30 minutes in construction, and then another hour sitting in traffic in Louisville. I still don't know why the traffic was so backed up in Louisville - all I know is that I sat and inched forward for an hour - and then all of a sudden, the traffic started to open up and I was doing 65-70 again. Go figure! Note to self - just take the Rockford/Paducah way…(which I will do on my return - to skip the issues or delays!) The only saving factor, was that I downloaded a book on tape onto my iPhone - so I listened to a detective book the whole way - which really helped pass the time on the drive. It was a book from the TV show Castle. The story of Nicky Heat - which is the character in the books that Castle writes on the TV show. It actually was pretty good! :) Besides I love mysteries, detective, or murder stories. while she makes me sausage! I arrived at Mary Pickhardt's home about 7pm - and stayed with her the first few nights I was in Shelbyville. Upon arrival, I was met by her two golden retrievers - who made it difficult to drive up the driveway in my car. Then they proceeded to tail wag, as I unloaded my suitcases and pillow, and moved into the guest room. Or, as Carol Olp insists - "her" room. But, no worries Carol - I'll be gone before you even land in TN later this week. The evening was spent catching up, watching reality TV and laughing so hard we were crying. I love staying with Mary - its always fun. And I think all her cats and dogs like me too. 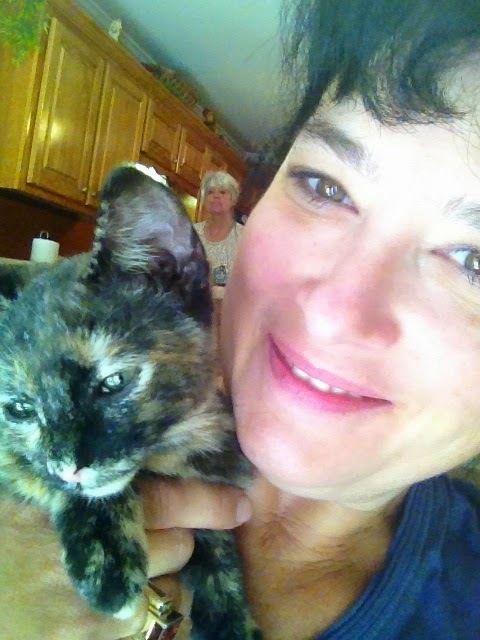 I enjoyed the newest member of her clan - Scarlet - a calico kitten she just picked up a week earlier. SO cute! Monday morning I had to work a half day, and Mary made me a hot breakfast - yummy! I then headed over to the Celebration grounds to ride Halo. Hannah was expecting me and I headed up to Champions arena where she was working horses already. Soon, Halo arrived, and I watched as Hannah warmed him up. She makes it look so easy - and she makes him look really really good. While you can definitely tell he's young and still figuring it all out - he definitely looked more advanced than when I last saw him a few weeks ago during the International. My turn was next. And, I struggled to get into the groove with him. Arghh…not now! I need to be showing in a few days. Hannah provided some instructions and I continued to ride and try. But, honestly, I was not getting a good feel of him. I'm sure it was a combination of the pressure, the long trip…and just trying to remember how demanding it is to ride a 2 year old - my ride ended with me pretty frustrated. Hannah was probably pretty frustrated too - although she provided encouragement, and sage words. I will definitely need to work this out in 24 hours - or forget showing. The whole line-up of banners at the HP Stables. Halo hangs with EXCEPTIONAL company. That evening, Mary and I went out for mexican for dinner, and then afterwards headed back over to the Celebration grounds so she could meet Halo. He was all tucked into his stall with a huge mound of hay. He looked up and walked right over to us when I slide the door open. He's so sweet, and very friendly. We pet him and he just hung out for more attention. We then took a walk to see what was happening on the grounds. Despite it being dark, after 8pm, and the grounds mostly quiet and shut down for the night, Hannah was still working horses up at the Champion arena! That women does not stop - she's so dedicated. She came over and I introduced her to Mary and we talked a little while. But in no time, Hannah was back to working the horse, and we took a stroll around the grounds before heading back to Mary's place - and turning in for the night. Ready and waiting on the cross-ties. On Tuesday, I again worked all morning, and headed back to the grounds to ride Halo after lunch. 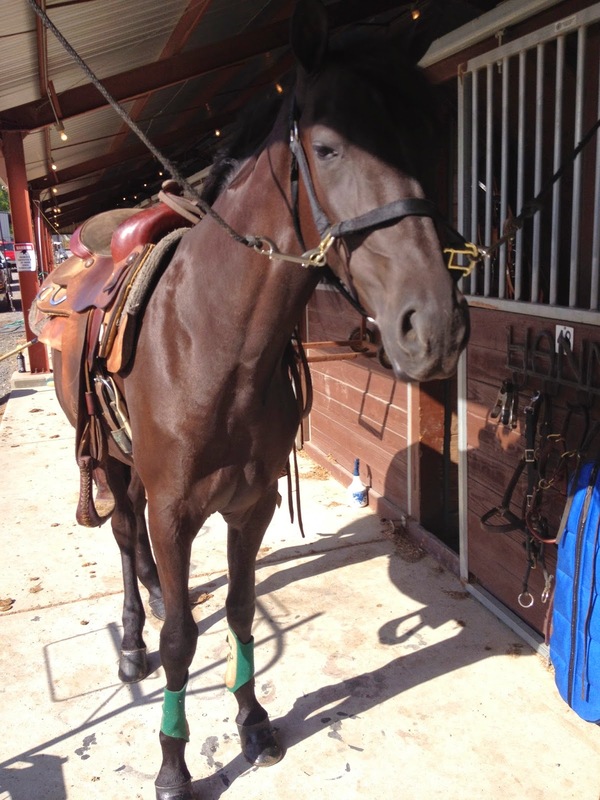 He was in the cross ties all tacked up and ready to go at the barn. I volunteered to walk him up to the Champions arena. Hannah Pulvers Stables was in barn 20/21 - which was on the East end of the show grounds - and at the bottom of a hill. So, we had to walk slowly up the hill, and then back down - in order to get to the arena. This wouldn't be so bad - as maybe the walk is 3-4 blocks in distance - but the road had been sealed recently, and it had been raining off and on - and so the pavement was very slick. Hannah had mentioned that she had a few horses slip and slide over the past few weeks on that walk - so the directive was to walk slow, and try to get the horse to walk on on the stone or grass along the side of the road as much as was possible. It also meant, navigating trucks, golf carts, plants, garbage cans, people, and all kinds of scary signage, banners and such. I was so impressed that Halo took it all like a champ. He just walked along, as if none of this was any big deal. His head was low, he placed each step carefully, and just navigated it all so calmly. Not once did he shy or spook or even bat an eyelash. Amazing for a 2yo. With every step, I liked him more and more. He's a sweetie, and a level headed one. How did I get so lucky again! 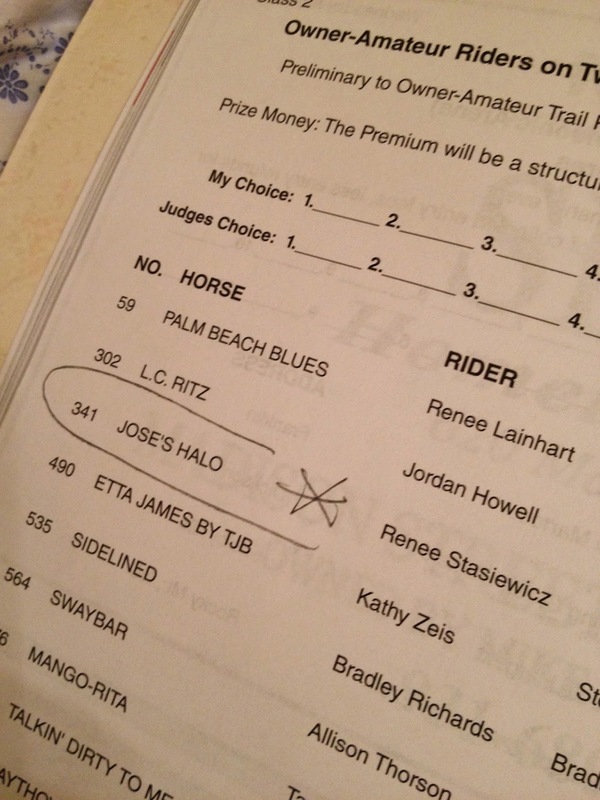 When we got to the arena, Hannah started out riding Halo. As I watched, I could tell she was working hard to get him where she wanted him - and he was not necessarily hitting his gait correctly all the time - or keeping it long once he did. Oh boy - I'm not feeling very good about how my practice ride will go today on this youngster. When she stopped and got off him - I wasn't sure if I would even be riding - but she nodded to the stirrup and indicated I should get on. We won't know until we get me up there - how we'll do. So, this would be a good chance to see how it goes, and decide if we'd be ready enough to show tomorrow. I had my druthers at that moment. And my visions of showing this year were fading fast. We started slow. I was dog walking him, and then started to push him up a bit. I could feel him go out of gait, and set him to try to correct him. It worked! I then got on the rail, and began to work him around the ring. He'd fall in and out of gait - but I could feel him much better today and make the corrections (sometimes even before Hannah had to prompt me). And although it was constant work - we seemed to be working as a team. And, once I got into a groove with him - I could release more in the reins, and felt the great work Hannah has done with him. He'd hold his gait, and on a loose rein. Cool. Hannah's comments were also very positive - and after riding for a while, I was gaining more and more confidence. As my ride ended, I tossed my fist up in the air in success. I felt a lot better today - and Hannah said that was the horse and ride we needed to put in the ring tomorrow. Oh, I better start praying that THIS is the ride I accomplish, instead of the one I had yesterday. Whew. Halo meets his banner self. I think he likes him! That evening I went out to dinner with Mary, Tami Steinbrecher, Kim and her daughter. We had a great Italian dinner in DT Shelbyville - just off the square. It was so nice to see Kim and catch up with her - and we all shared horse stories. Kim used to show up in the WWHA, and her and Jim moved from Illinois to Tennessee a number of years ago. They were currently in the midst of building a new home - so it was exciting to hear about the progress! I don't think anyone wanted to end the night - we continued the conversation outside the restaurant out on the sidewalk….and then finally said our good-byes. I followed Tami back to Clearview after dinner - as I was moving into a villa with her for the balance of my stay. It was just a 5-10 minute ride into the country. Then a left turn and a long gravel driveway ride up to the building where the bed and breakfast rooms all existed. Our room was great - and more than ample room for the two of us - and Lola, her dog. Lola was pretty happy that we arrived! 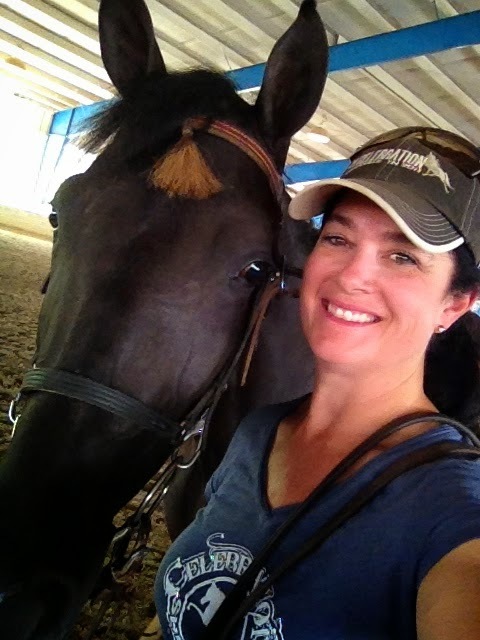 We talked awhile about showing and horses - but I headed to my room soon, to get a good night's rest, before my big day - and my very first show ride on Halo.